Can you guess the band who made the song How to Disappear Completely? If you know, do you know the album it comes from? The band is Radiohead. The song is taken from their fourth album, Kid A. Don’t panic, How to Disappear Completely is not a trivia book set out to demonstrate that your musical knowledge isn’t as expansive as you initially thought it was; it is an enlightening graphic novel demonstrating the power of music to motivate people to take action and to do good. Radiohead is not the only featured artist; over twenty artists ranging from Ghostpoet to Dexys Midnight Runners help tell the story of How to Disappear Completely. How to Disappear Completely opens with the prelude. We see a few pigeons occupying a flat balcony in Leeds, an alarm clock set for 6 am goes off as instructed and a man, our narrator, wakes up and performs his routine tasks before heading to work in an office. We discover that a year ago our narrator lost his father and as a result, he has inherited the family business and “a great record collection”. His father has taught him two things: firstly that the family business is not for him; secondly, “it was time to grow up…” Nonetheless, these revelations don’t stop him trying to find his father by listening to his fathers’ record collection. Our narrator then realises that he can lose himself in records, but not completely disappear as reality kicks in “when the music stops”. Whilst our narrator dislikes the “ugliness” of Leeds town “gaudy excesses…” and “satanic malls”; he believes there is a beauty too and music can help “transform” the city for the greater good. The cure, according to our narrator is for him to “experience some hardship” and “embrace nothingness”. Sunday is an important day for our narrator; he decides not to take BLZ Global up on their offer, deletes his Facebook page, and packs a few basic belongings including a sleeping bag and a family photo of him and his parents. The end destination is an abandoned building. Despite sleeping in a sleeping bag and being woken up by rodents who have greedily consumed his Jaffa cakes and it being a Monday morning; out narrator wakes up in a good mood. He happily washes his teeth using bottled water, does several press ups and sets himself to work painting the walls of the first floor of this building. As the days go by our narrators’ artwork becomes more adventurous; for example, he recreates Hokusais’ The Great Wave of Kanagawa and the solar system. Our narrator encounters many challenges including, but not limited to tiredness and coping with solitude yet continues to work and the standard of his work improves with his hardship. He gets a nod of approval from the many pigeons and snails that gradually festoon this building. 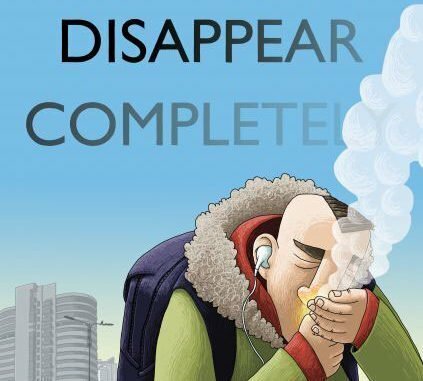 The artwork by illustrator Si Smith throughout How to Disappear Completely is unique and is as much of a guide to the reader as is the accompanying soundtrack to this graphic novel. The revolutionary use of colour is more than decoration; it also tells the story of the emotional state of our narrator and his impact on his surroundings by his actions. The way Smith illustrates the letter received from BLZ Global and his depiction of the relevant points from this letter for the benefit of the storyboard is innovative; ensuring the reader remains stimulated by How to Disappear Completely. Smith also has a subtle art of telling the entire story as laconically as possible; there are no surplus words or pictures; yet deep detailed analysis, debate and a fecundity of emotions is possible. Where the songs in the playlist feature lyrics; Smith depicts the lyrics to these in the story as the narrator listens to vinyl and his iPod mini. Of the many lyrics featured, look out for Blackbird by The Beatles on page six, Bitter Sweet Symphony by The Verve on page thirteen, Cloudbusting by Kate Bush on pages twenty-two and twenty-three and Airbag by Radiohead on pages sixty- two and sixty-three. Whilst you won’t be able to disappear completely and you won’t have “figured it (all) out”; it is impossible not to come away more enlightened from experiencing a new way of enjoying a graphic novel with a unique approach to attitudes and the application of music and lyrics as a guide and a tool for life.